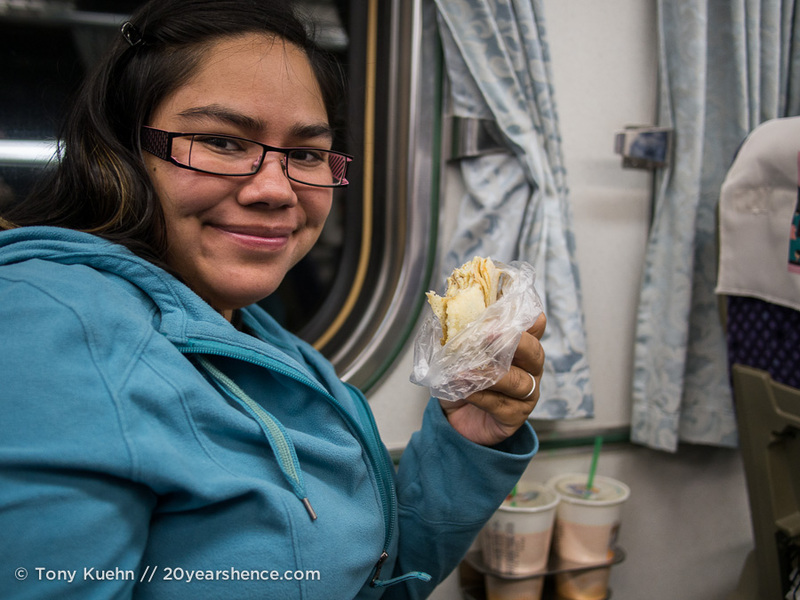 To absolutely no one’s surprise, food was the primary motivating factor behind our unanticipated jaunt to Taiwan. Upon our arrival, we set out to conquer as much of Taipei’s food scene with our mission simply being “eat all the things”. Given the crazy amount of food that we consumed at Taipei’s various night markets, I wouldn’t blame you if you assumed that this is where we did all of our eating and that our mission was a success… Of course, while it’s true that you can dine like royalty at Taipei’s night markets and we definitely overindulged at every single one, there are other “can’t miss” dining experiences to be had and we were determined to explore those as well. Thankfully, we had a lot of help in the form of Jackie, our amazing CouchSurfing host who took us under his wing and pretty much acted as our guardian angel during our stay in Taiwan. Whether it was booking us train tickets, helping us procure a new underwater camera and housing, or hooking us up with friends in other cities, Jackie always had our back and we are so incredibly grateful for every day we spent with him. Not least of all because one of the first things Jackie did for us was print out an article listing 40 quintessentially Taiwanese foods to guide our eating during our 18 days in the country. 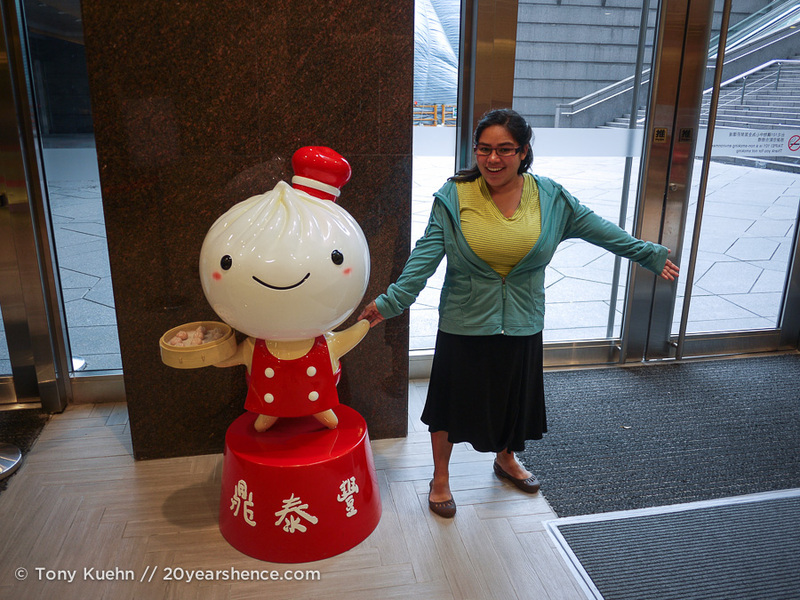 First up was a visit to Din Tai Fung. 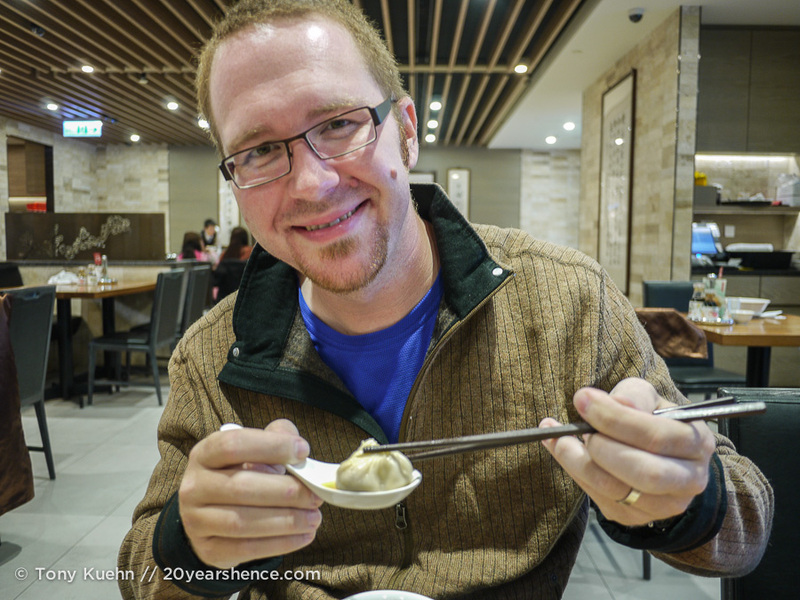 Sure, the Din Tai Fung in Hong Kong is the one with the Michelin star, but we learned pretty quickly that the normally happy-go-lucky Taiwanese would get pretty ferocious if we mentioned we had been to DTF in Hong Kong but not in Taiwan where the chain originates. 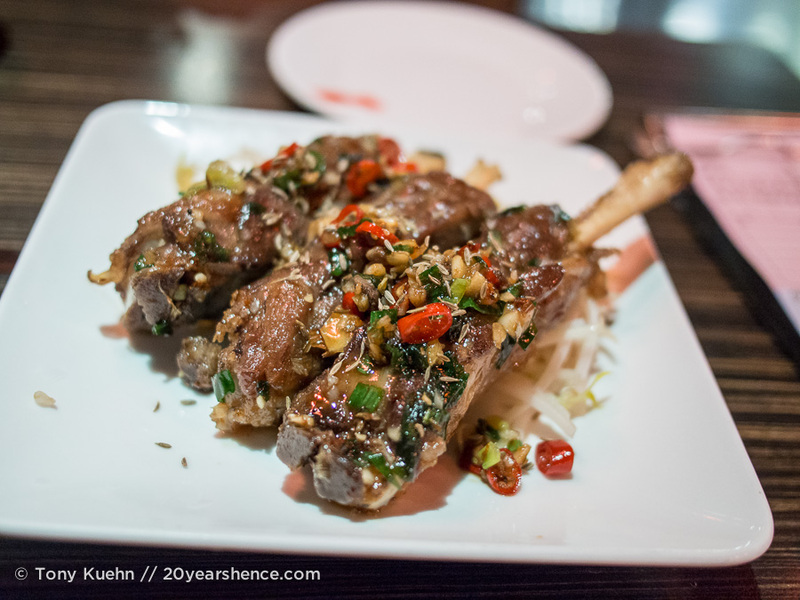 We toyed with going really traditional and seeking out the original branch, but wound up going with the newest, swankiest location found in the basement of Taipei 101… it doesn’t get any more Taiwan than that, does it? From the moment we stepped through the doors, we could not stop smiling. We loved DTF in Hong Kong and didn’t think it could get any better, but the staff here really did their best to prove us wrong. Our waiter was fantastic, so incredibly kind and solicitous, asking us tons of questions and making us feel so at ease and like we were honored guests. And of course, the food was just as fabulous as we had remembered! This time we feasted on: special xia long bao (soup dumplings) filled with crab roe & pork; a fragrant soup brimming with tofu skin, wontons & clear green bean noodles; sticky rice & pork dumplings; and shrimp wontons drizzled with a sticky and incredibly addictive spicy sauce. This was actually the first meal we had in Taiwan and it definitely set the tone for the excellent 3 weeks of food that awaited us. Din Tai Fung might be one of Taiwan’s most famous food exports, but another type of food became inextricably associated with the country in our minds: Buddhist vegetarian restaurants. We visited our first one during our trip to Longshan Temple, where a torrential downpour forced us in off the street into the first eating establishment that had room for us. There was no English anywhere, but we were starving and the food looked good, so we decided to give it a shot. We started pointing at things and breaking out our rusty Chinese that had done us so little good in China and seemed about as useless here too… In the end, we wound up resorting to the tried, tested and true method of simply pointing at the bowl of a fellow patron and hoping for the best. Thankfully, the man whose meal we were trying to copy spoke excellent English and wound up ordering our lunch for us! Our socially awkward ordering wound up being a great icebreaker for a really lovely conversation in which our new friend explained that we were in a vegetarian restaurant and would that be ok? 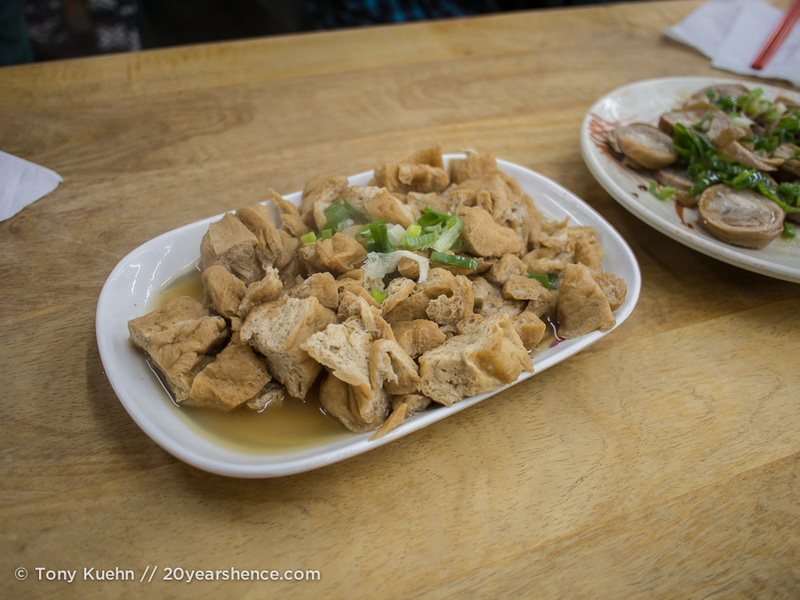 After months of such a meat-intensive diet in the Philippines, we were happy to have a break from animal protein and enthusiastically dug into our piping hot soup that was crammed with mushrooms, lettuce, peppers and sweet little red mystery veggies, and came with side dishes of tofu and pickled bamboo. The food was warm, welcoming and completely satisfying even without any meat. 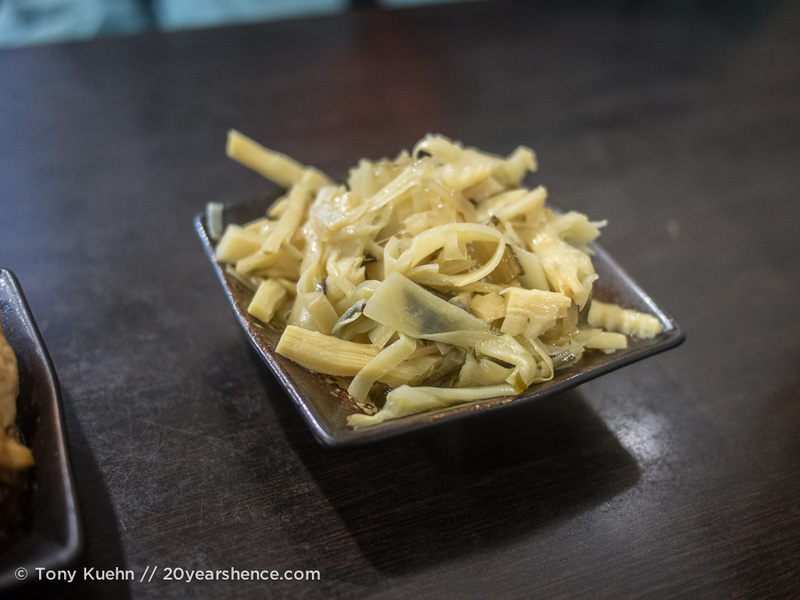 This was just the first of many times when our eyes would light up upon seeing one of the many temples found in Taiwan as we knew that without fail, a delicious vegetarian feast would be found nearby! 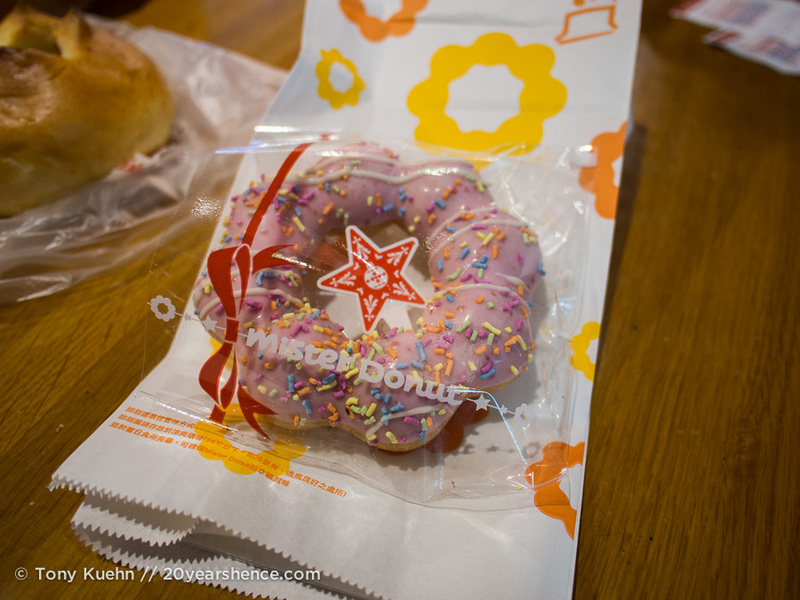 Do not deny the beauty that is the mochi doughnut. They even package it nicely! 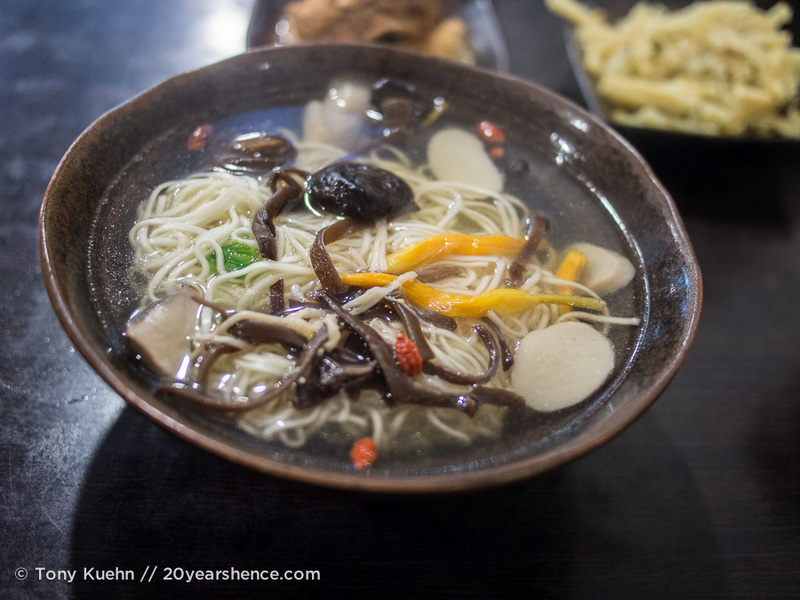 During our early days in Taipei, echoes of Japan had us frequently seeking out malls and department stores in search of food, as these had been some of our favorite dining locations in the land of the rising sun. To be honest, food courts didn’t seem to be quite as extensive in Taipei and the food on offer was generally surprisingly expensive, so we soon realized that this was obviously one Japanese influence that hadn’t yet made its way into the culture. We did eat at one food court restaurant where we ordered XO noodles with shrimp & mushrooms as well as a plate of Yunnan-style cumin-encrusted ribs. Despite the fact that we had ordered solely based on which items had pictures on the entirely-in-Chinese menu, both were really good. Bonus points for the fact that during this meal, we actually were able to ask our waitress for cold water in Chinese and she understood us!!! 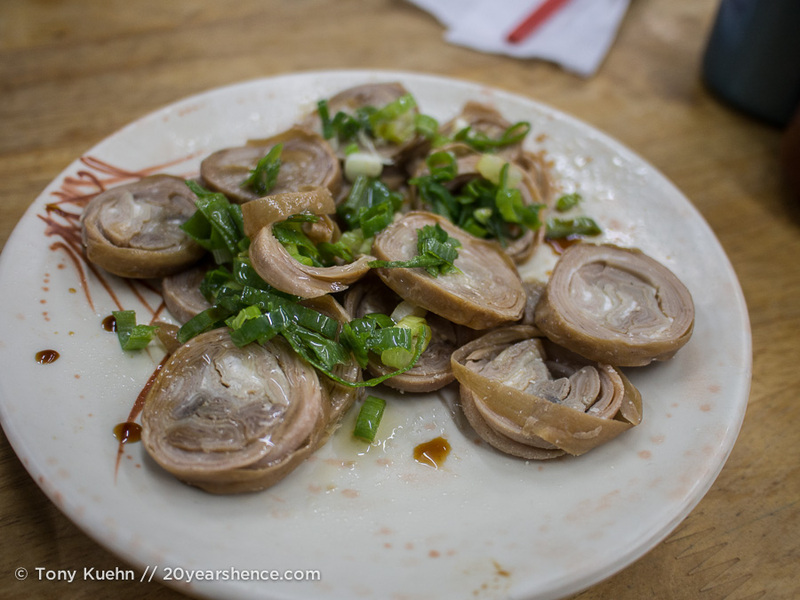 We did pretty well sourcing food for ourselves, but by far our best meals in Taipei happened when we had Jackie guiding us to the very best eats. Determined that we start the day off right, Jackie brought us some traditional Taiwanese breakfasts to try, which involved a thin crêpe wrapped around a fluffy omelet, and a crispy sesame flatbread wrapped around a deepfried pastry stick known as you tiao; we really enjoyed the crepe, which was soft & chewy, though we did find the second dish to be a bit greasy and something of a starch/carb overload for us. We really like you tiao, but the starch wrapped in starch was a bit like making a sandwich where crackers are the filling. We washed it all down with big glasses of warm soybean milk (dou jiang), which we now consider one of our ultimate comfort beverages! 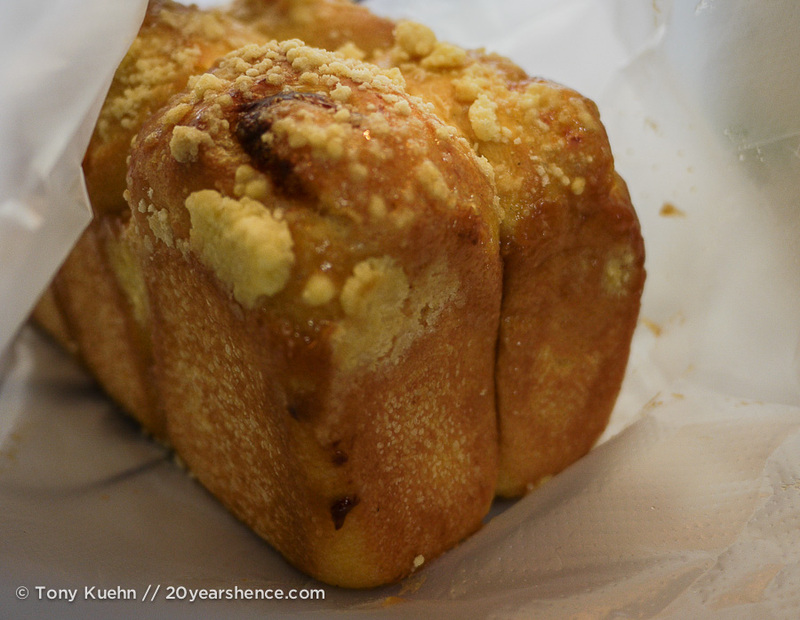 You can get your dou jiang au naturel, lightly sweetened, or even slightly salty! 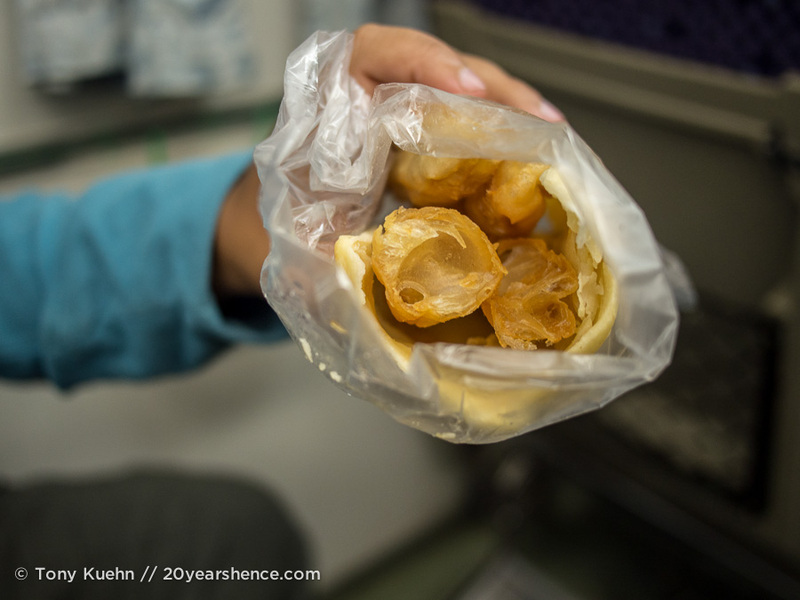 You tiao are obviously the breakfast food of choice in Taiwan, as on another occasion, we were served up sticky rice rolls that were wrapped around these crunchy sticks of pastry, pickled cabbage, and the dreaded pork floss we had tried so hard to avoid! Despite all the horror stories we had heard about pork floss, we had to admit that it didn’t really taste like much, and we wound up quite enjoying this unconventional breakfast food. This dish was far less greasy and the soft rice and crunchy you tiao made for an interesting interplay of textures that worked much better than the “crunchy on crunchy” combination with the flatbread. On another occasion, Jackie took us out for the Taiwanese version of brunch, which essentially involves Asian twists on American/Western food. We dug into a teriyaki pork burger, a BLT, and two more egg crêpes (one with ham, one with cheese). Between mouthfuls, we agreed that it was all a bit unconventional but undeniably delicious and filling; pretty much it was the ultimate drunk food/hangover cure! 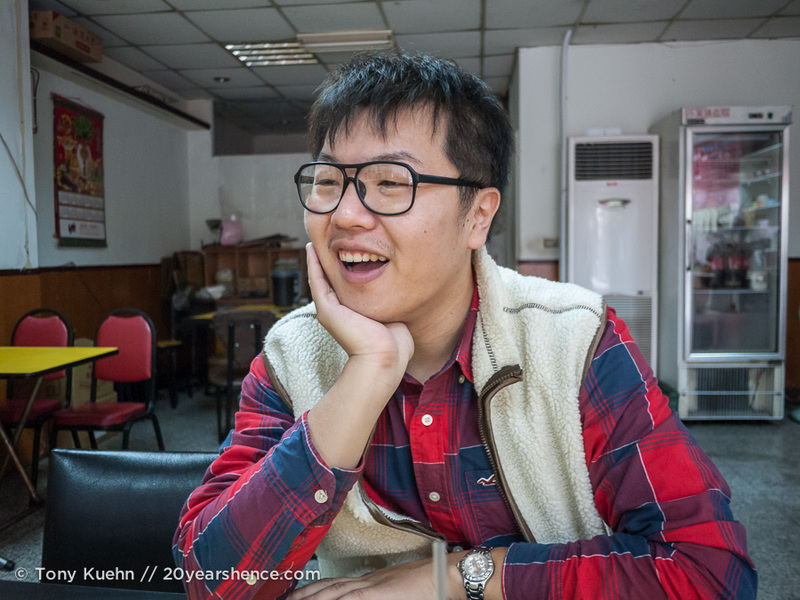 Lunches with Jackie were just as exciting as breakfast—one day he brought us some zongzi to try. Zongzi are triangular dumplings made up of sticky rice that are stuffed with chicken and vegetables that are wrapped in bamboo and steamed. 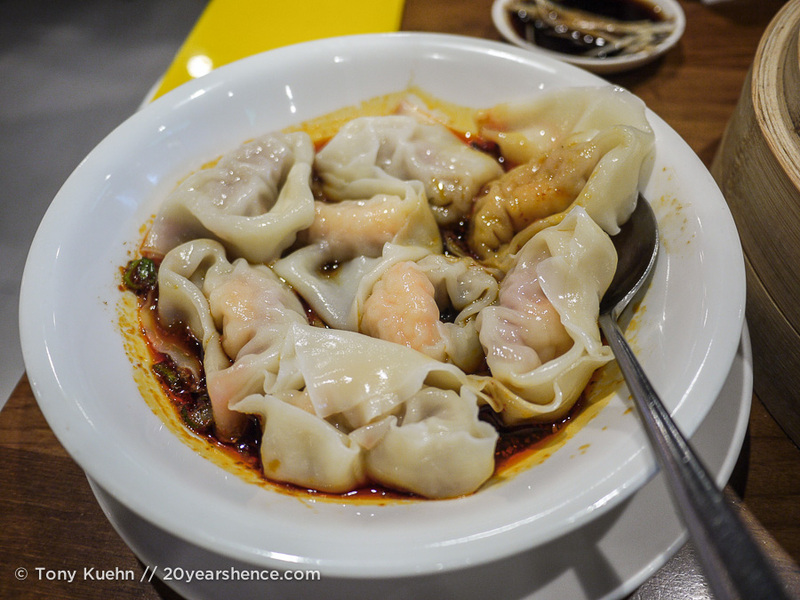 Not only were they delicious, but Jackie also shared the rather interesting history surrounding them: back in the day, there was a famous Chinese poet named Qi Yuan who drown himself when his homeland was conquered by an invading army. Apparently zongzi were thrown into the river to stop the fish from eating his body, and now they are eaten to commemorate Qi Yuan’s death. 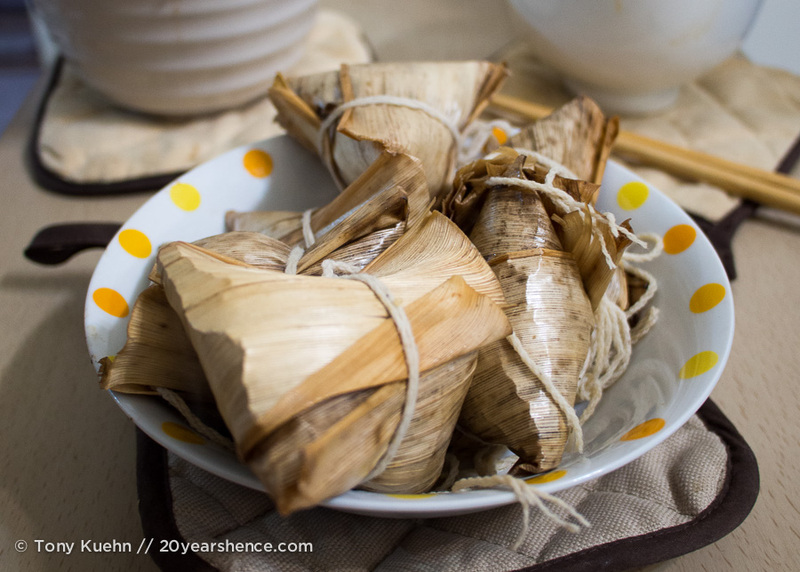 Given the importance placed on zongzi, we worried they might not be all that tasty and had simply persisted because of their symbolic importance, but they were actually really delicious (and very filling! I could barely finish my second one!). Jackie also took us to one of his favorite “hole in the wall” lunchtime joints (our favorite kind!) to try lu rou fan, which is a very hearty rice dish that is mixed with fatty pork and pickled vegetables. As you can see, lu rou fan is incredibly rich and a little bit went a long way! The pickled veggies are supposed to help offset the fattiness of the pork, but it was still a bit much for the two of us. 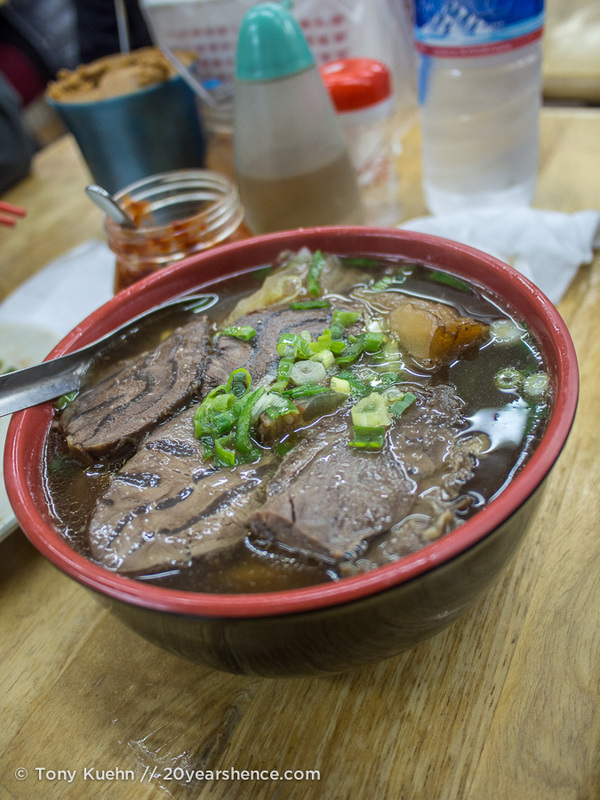 Another dish Jackie assured us that we could not miss was beef noodle soup, which is Taiwan’s national dish! For this one, Jackie brought in the big guns and called on his friend and coworker, Aboo, to take us to the purported best beef noodle restaurant in all of Taipei. The front of the restaurant seemed devoted to selling lottery tickets with the food hidden away in the back, so there is absolutely no way we would have found this place on our own! We were so lucky to have two people so invested in our food education, because despite the hype, this stuff was SO good. Beef noodle soup is a lot like the Vietnamese soup, pho, but stripped back to its very basics. It features a very rich (but not overly spiced) broth that is exceedingly beefy, huge tender chunks of beef shank, and these amazing noodles that were obviously homemade had just the right amount of chewiness. Apparently this is the number one dish that Taiwanese emigrants miss and now we know why! Along with our beef noodle soup, we also had a plate of cold, pressed beef rolls with a lovely scallion-infused sauce, and a plate of fried tofu. As you can see, we ate many incredible meals with Jackie, but I think the final meal we shared together is the one that I will always treasure most. For days, Jackie had been raving about this really popular ginger duck hot pot place near his apartment. 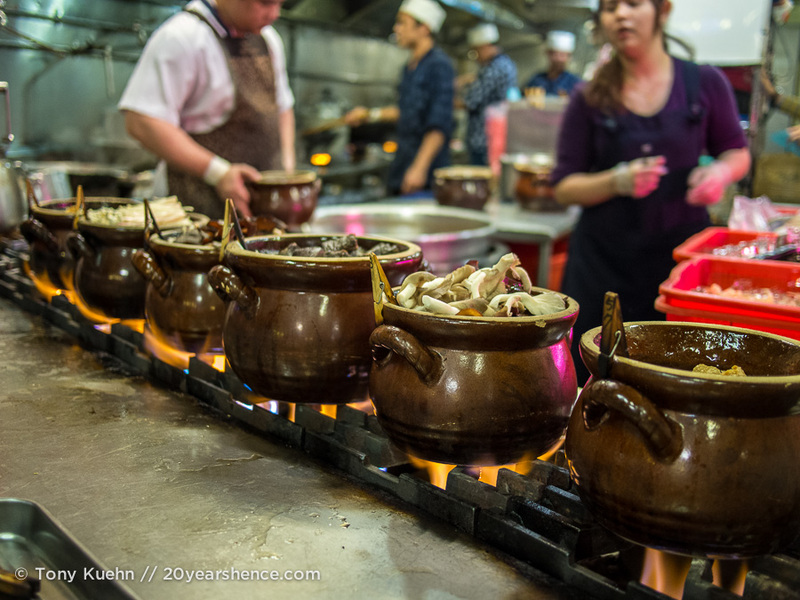 Hot pot is a big deal in Asia, but it’s not really something that either Tony or I ever craved and we didn’t really understand what the fuss was about, but Jackie had yet to steer us wrong so we told him we were up for trying it. 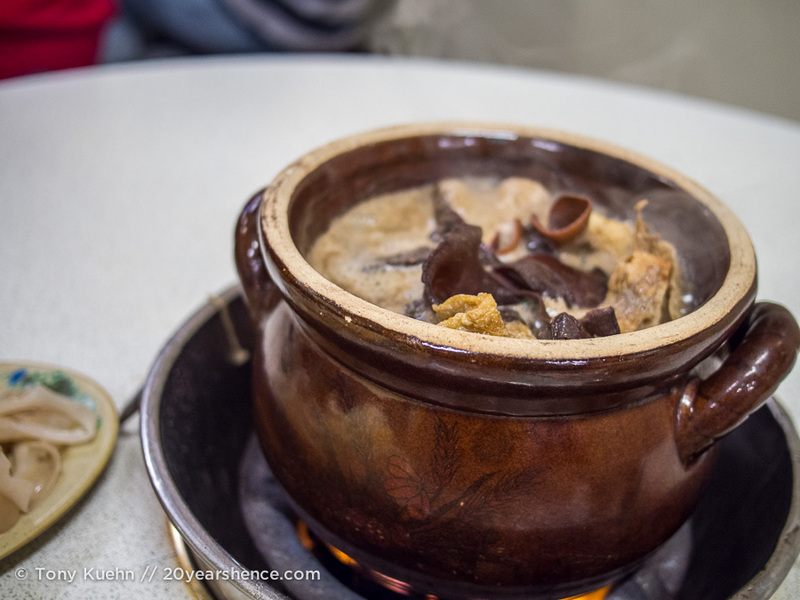 When we arrived, the joint was jumping, and we wound up having to wait for over an hour in order to get a table, so the bar was set incredibly high… One bite of this hot pot, and it was like a light bulb went off in our heads: we finally understood why people get so excited about hot pot. Our hot pot featured duck meatballs (which we referred to as Amazeballs), crispy mushroom, cabbage, tofu skin, duckblood cake, and intestine, all in addition to the big pieces of duck that simmer in the stock that arrives at your table and are unbelievably tender and flavorful. Not only were the main ingredients excellent (except for the intestine, which wasn’t bad just a bit insubstantial), but the broth was out of this world! It was so flavorful and nourishing and the ginger flavor so perfectly infused everything and warmed us from the inside out. Jackie told us that there is no point to hot pot if the broth isn’t good enough to sip on its own, and I think this was the missing piece that finally clicked into place here. The icing on the cake was this fantastic salty tofu-based sauce that you would dip everything in before gobbling it down that added that final umami layer to every bite. We’ve eaten a lot of incredible meals on this trip, but I definitely consider this ginger duck hot pot to be one that was life-changing. One of the big draws to hot pot is that it’s such a social meal with everyone cooking together and I think this meal with Jackie really helped us appreciate the spirit of that. Obviously there’s so much more to Taipei’s dining scene than its already incredible night markets. There aren’t many times on this trip that Tony & I wistfully think back on our much fatter pre-trip physiques, but they would have come in handy on quite a few occasions while in Taipei. Often we would find ourselves cursing our shrinking waistlines (and—consequently—stomach space), so it’s little wonder we kept adding an extra day to our time in Taipei so we could try just a few more things the next day. It truly is a place where there is too much good food and not enough time to try it all! 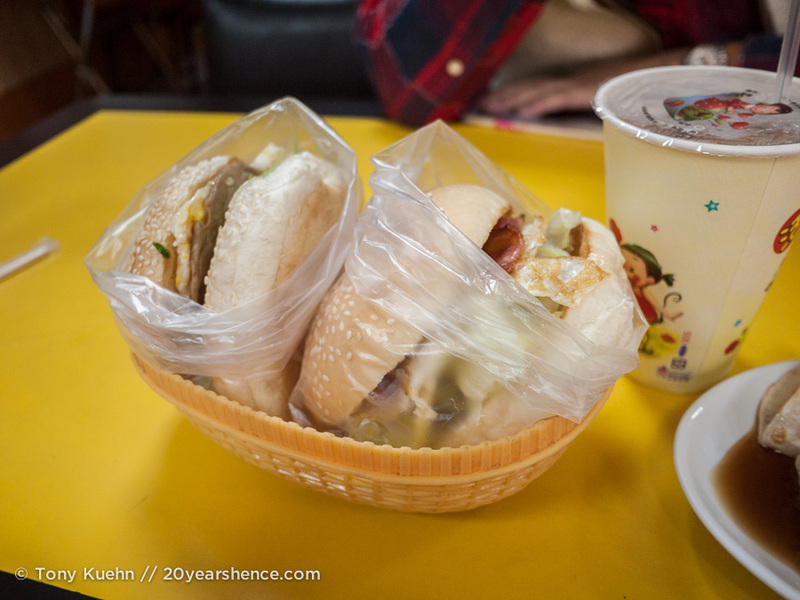 Tell us: do you know much about traditional Taiwanese foods? 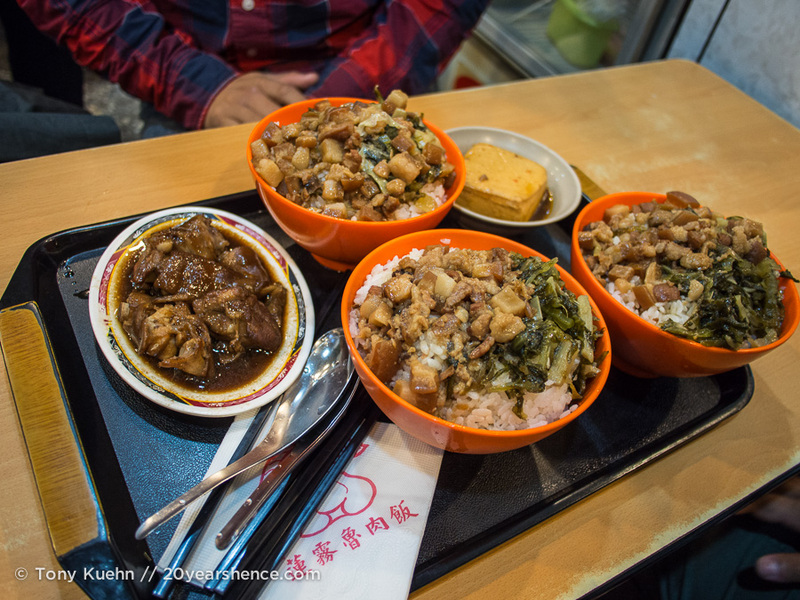 Which of these dishes would you most like to try if you found yourself in Taipei? Yummy, yummy, yummy! I want dumpings so bad now I think we’ll definitely have to go to Taiwan for Christmas! Bethaney – Flashpacker Family recently posted..How to Find Cheap Flights in Australia – Half Price Jetstar Flights! Just remember: northern Taiwan in the winter will be chilly (we were there just a few weeks before), but if that’s an issue, just head south! We have more posts about other parts of the country coming up! I have to get myself to Taiwan, godammit! It’s always been on my “must see” list, but these pics make me desperate to go. Trust me, I understand! 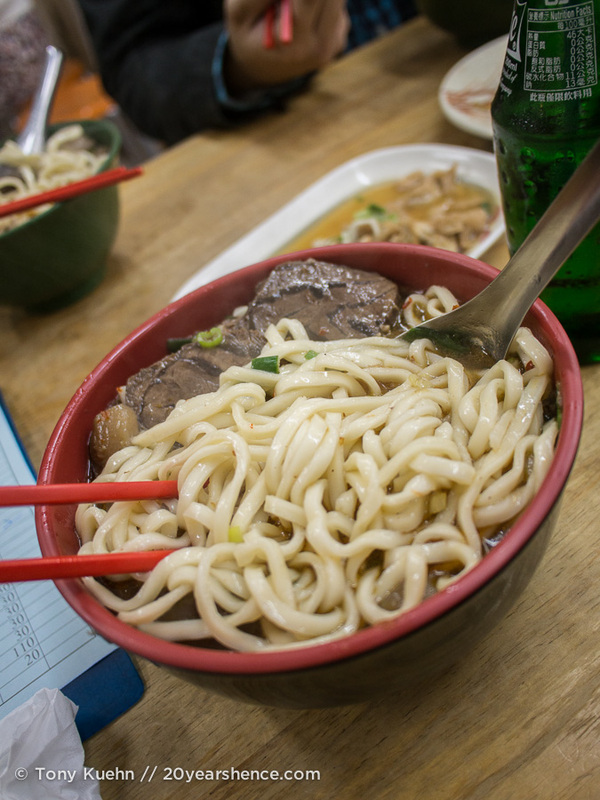 Once we started reading about the food in Taiwan, we were wondering why it had never been on our itinerary in the first place! And then we got there and it was better than we even dreamed… people who overlook Taiwan are missing out, but hopefully we can send some love its way! Seriously, food in Taiwan is amazing. 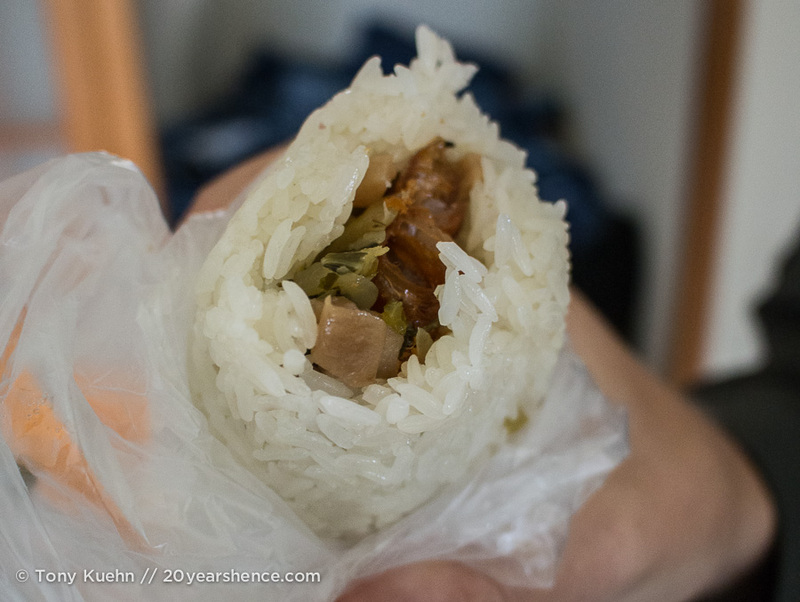 That rice burrito (forgive me as I butcher it) with the pork sung is so good. We got that like everyday. There was this cute little lady who sold it where we stayed in ximending. We get going back so much, she knew us! Strangest thing, though. Never went to the din tai fung. We have one here where we live, so maybe that’s why. Also, I freaking love shaved snow. I swear it’s even better tasting in Taiwan. Gah! What is their secret to making everything taste so good. I must know!! 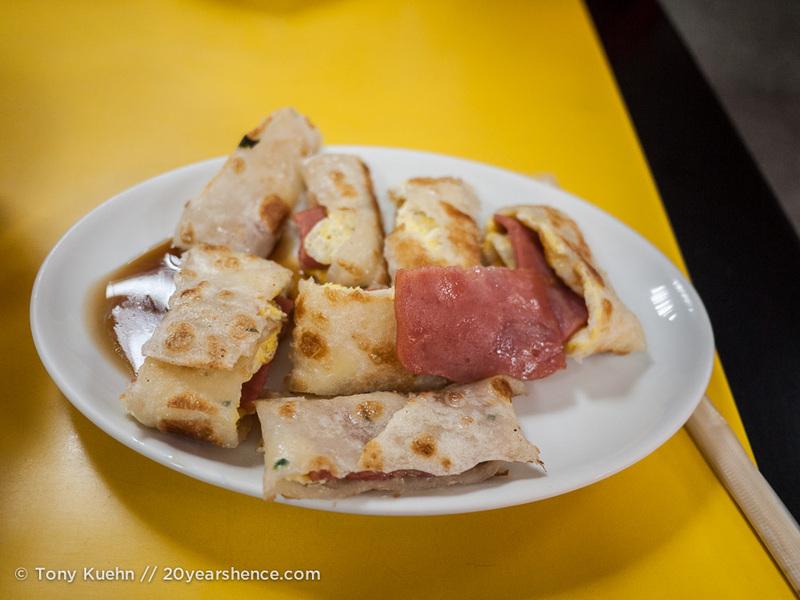 Taiwan is one of the countries we have visited where we still routinely have intense hunger cravings for its food, and of course, the more we travel, the more we realize how singular its cuisine really is. I mean, the food it Thailand is awesome, but you can pretty much always find a Thai restaurant and some iteration of its cuisine wherever you go… Taiwanese food, not so much! 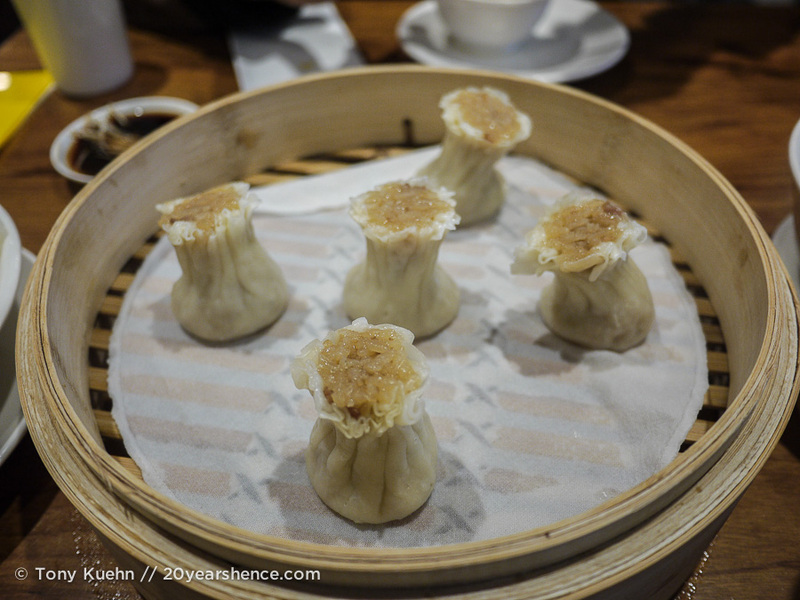 You have to go to Din Tai Fung! It is SO good, even if it is a chain! We kind of make it our thing to eat at them whenever we see them now because they never disappoint! 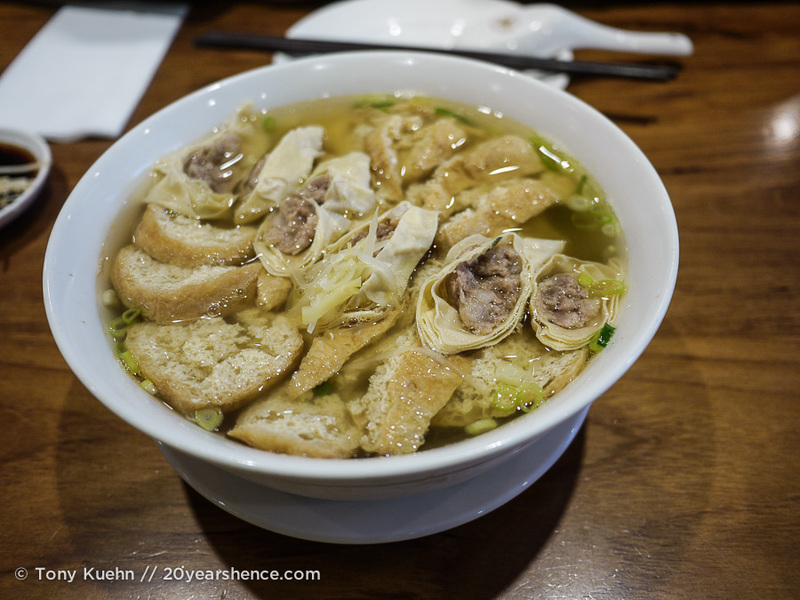 I’ve been to a few Taiwanese restaurants in Vancouver and had my fair share of beef noodle soup and salt & pepper chicken, but this post has got me itching to revisit them when I get back in a month and try some other things! YUM! Toronto has a pretty big Taiwanese community (though likely not as big as Vancouver), and yet I can’t believe I’d never tried any Taiwanese food before. What a huge oversight on my part! 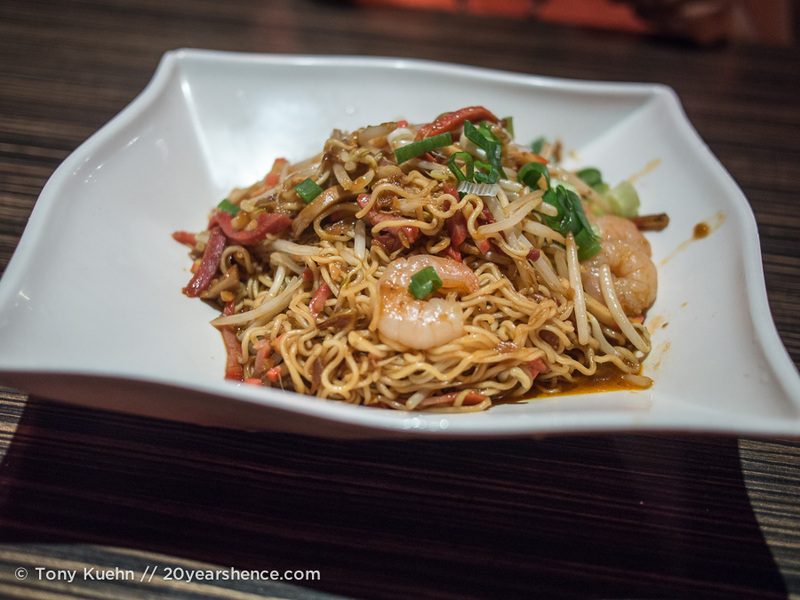 I thought it would essentially be Chinese food but it’s definitely distinct… and definitely delicious! Beef noodle soup was fantastic, but then again, so was nearly everything else we tried! Can’t wait to hear about what you try; please report back! Aww, those teddy donuts are so cute! Why I am still attracted to pink childlike things at the age of 32 is a mystery, but I would have bought some as well. 🙂 Those sticky rice rolls look amazing as well. Didn’t know anything about Taiwanese food before really, but I have to say it looks pretty yummy to me! Okay, that’s it. I HAVE to go to Taiwan. Glad you guys enjoyed your couch surf! Seriously, you really really do. And if you love couchsurfing, you will find no better place to do it than Taiwan. We will write a post at a later date about the awesomeness of CS specifically in Taiwan because we did it 3 times and every time was amazing! Why must I keep reading these posts before lunch? Not only does my lunch sound incredibly boring, but now I’m also really hungry. Don’t worry, these posts are just as dangerous to write as they are to read. Tony & I have each been caught on separate occasions since starting to write about Taiwan looking at plane tickets back there… whenever it happens, the person who has been caught looking starts wailing about how the food was so good & they just want to go back… So once Taiwan catches you, it may be difficult to escape! 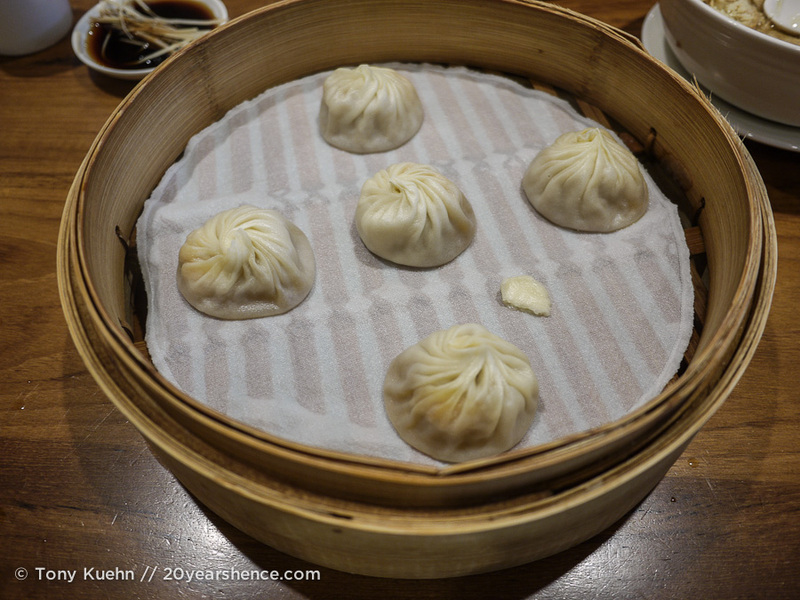 DTF actually serves Shanghainese cuisine – xiaolongbao are a Shanghai specialty. Needless to say we go all the time. We have friends who lived in Taipei who told us the food at the original location is so much better than what’s served in our local chain. I have a hard time believing the dumplings could get any better so I expect my mind to be blown when I eventually make it to Taiwan. 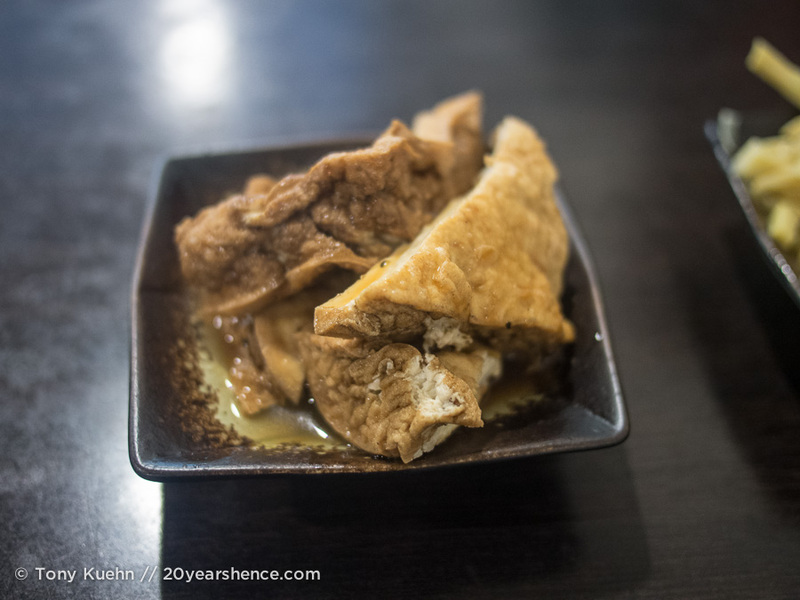 That’s true that XLB are a Shanghai specialty, but DTF is definitely a Taiwanese creation. Another CouchSurfing host told us that one of the reason why the XLB at the DTF in Taiwan are superior to elsewhere is because they are smaller so you can eat them in a single bite rather than having to nibble on them. I am not an XLB expert by any means, but I sure do like to eat them! You guys did an awesome job tasting the best of Taipei! I love DTF, and we always recommend it to people visiting Taiwan. You mentioned so many things that I love-getting hungry just thinking about dan bing and zongzi! I can’t believe you tried ginger duck hot pot!! We have only had it once, and as much as I love ginger, I can’t say I was a huge fan. It does warm you up in the winter though, and you are right about the community aspect of it 🙂 Did you get to try Suan La Tang (sour and spicy soup)? I just learned how to make it last night and I am so excited as it is one of my favorite Taiwanese dishes! Casey @ A Cruising Couple recently posted..Big Life Changes – What the Heck Are We Thinking?! We were a bit worried about the ginger duck hotpot as Jackie had warned us the flavor was very strong and a little bit of ginger goes a long way with Tony. But we wound up really loving it and I felt like the flavors were really beautiful and worked together in a wonderful way, and yes, really warmed us up! We did not get to try Suan La Tang; definitely one we’ll have to find next time!